Text by Judy Collins, Rod Mengham, Sam Porrit. Acanthus, asymmetrically, refers to a new work made by Wilding for the Offer Waterman gallery’s entrance hall in London and is inspired by the building’s heritage as the former headquarters of William Morris & Co. This site-specific wall piece; comprising hand-printed wallpaper with sculptural element attached, translates and re-imagines the Acanthus motif of Morris, rendered with a deliberate asymmetry, typical of Wilding’s sculpture. Wilding’s work is held in numerous public collections worldwide and she is recognised as one of the most important sculptors of her generation. Her work has been shown at the Serpentine Gallery and MoMA NY, and in three survey exhibitions at the Tate, including the Duveen Galleries in 2013 and a retrospective at Tate Liverpool in 1991. The exhibition at Offer Waterman’s Mayfair gallery includes 12 new and recent sculptures, alongside a selection of works on paper and prints. Richard Cork, in his book, New Spirit, New Sculpture, New Money; Art in the 1980s, neatly encapsulates the enduring appeal of this understated but mercurial artist; ‘a wealth of complex relationships can be uncovered in Wilding’s deceptively muted work by anyone patient enough to look’. Whilst she is known for the broad range of materials she has used in her sculpture, apparently delighting in the tension between hard and soft, transparent and opaque etc. 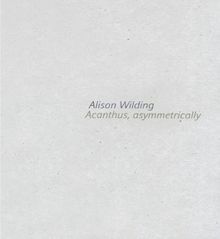 Wilding pragmatically refutes that materiality is a significant driver in her work, stating: ‘I’m not obsessed with materials and if I have used a huge variety over the years it’s because there’s lots of it freely available in the world. I don’t believe in a hierarchy of materials. All materials, however mundane, can be transformed’. Paperback, 9.5 x 10.25 in. / 72 pgs / illustrated throughout. British artist Alison Wilding’s innovative sculptures combine various forms and techniques to defuse and challenge the viewer’s expectations. This volume explores over 25 works by the artist and is drawn from Wilding’s ambitious display at the Duveen Galleries, Tate Britain, London (12 November 2013–9 February 2014). Each of the five major works on display brings together contrasting materials – from copper and alabaster to rubber and PVC – whilst testing the relationship between scale and weight. Alongside over 70 illustrations and an interview between the artist and curator Carmen Julía, a survey text by Anna Moszynska groups the works in relation to the sculptures made by Wilding throughout her over 30-year career. Paperback, 8.25 x 10.25 in. / 112 pgs / 70 color. Rising to international prominence in the 1980s, Alison Wilding is known for her sculptures made of Perspex and stone. 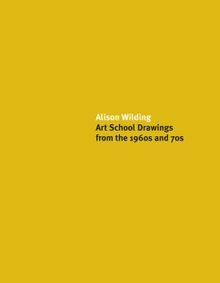 This catalogue presents 12 drawings from Alison Wilding’s art school years during the 1960s and early 1970s. Coinciding with her exhibition of the same title at Karsten Schubert, London (2011), the first nine works – collectively referred to as the ‘Ethos of the Petrol Station’ drawings – were a response to a project during the artist’s time at Nottingham College of Art, Nottingham. The final three works in the catalogue are from the artist’s time at the Royal College of Art, London, and were used as a tool for documenting and furthering her finished sculpture. Taken together, the works provide a glimpse into her progress in the studio at that time and connecting the drawings not only to student sculptures, but also to drawings and sculptures made almost 40 years later. Paperback, 8.25 x 10.63 in. / 32 pgs / 14 color. 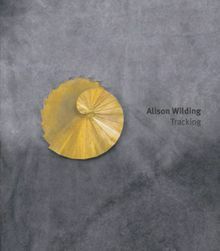 British sculptor Alison Wilding’s work explores inherent contrasts through her innovative approach to material. Using her recent work as a starting point, this volume provides a retrospective on the artist’s varied career. 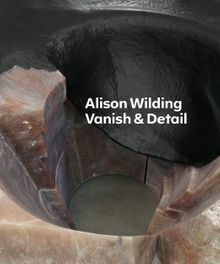 Wilding's sculptures often consist of two separate elements - which suggest opposites such as positive/negative, male/female, light/dark - through bringing together a range of different materials. With a special focus on recent works Tracking (2007) and Vanish & Detail (2004), this beautifully illustrated catalogue shows the subtle surfaces and shifts in scale seen within the artist's work. Accompanying full-colour illustrations, texts by poet and curator Rod Mengham, artist Sam Porrit and critic Judy Collins explore different aspects of Wilding's sculptures and their relation to changes within sculptural practice during late 1980s Britain. Clth, 8.25 x 9.5 in. / 64 pgs / 30 color.